Why wait around for a decanter, or drink wine that isn't ready? Life is Short, No Waiting for Enjoyment. 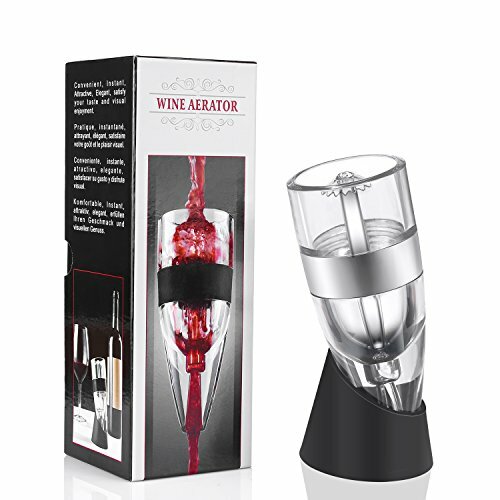 With our red wine aerator, you can transform any wine to a great wine in seconds. Built-in aerating system, your wine is easy to get infused with large amount of oxygen by utilizing the Bernoulli Effect. Just simply pour your wine into this wine aerator, you will enjoy the smoother, fuller bouquet and flavors! Why choose our wine aerator? Patented multi-stage design ensures 4x more effective aeration, the umbrella-shaped top and acrylic pour spout in the mixing cavity enable wine to contact air for multiple times, avoid blocking the gas inlet tube, and obstructs dust..
No worry any more about leaks or drips from the aerator when you pour wine too quickly. Made of food grade silicone, crystal clear acrylic and stainless steel, comes with FDA-approved patented design, durable for long years and great for wine lovers. NO WAITING: Our wine aerator employs a multi-stage aeration system to speeds up mixing proper amount of air in the wine, deliver a better bouquet, enhanced flavors and a smoother finish instantly. FOOD GRADE MATERIAL: FDA Certified Item, made of food grade silicone, crystal clear acrylic and stainless steel, durable for long years. IDEAL FOR ANY OCCASION: Perfect for party, wedding, dating, picnic, business travel, birthday, gift and award. If you have any questions about this product by ALTMAN, contact us by completing and submitting the form below. If you are looking for a specif part number, please include it with your message.